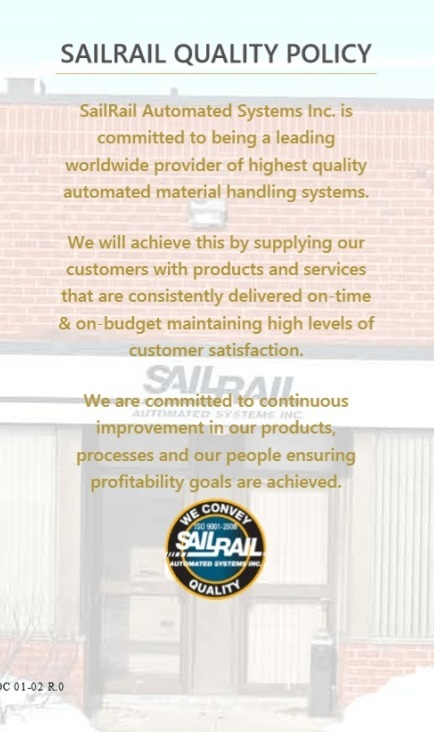 SailRail Automated Systems Inc., is a Tier 1 material handling and automation supplier to the United States, Canada, Mexico, South America and Europe. Specializing in linefeeding, conveying, exchanging and displaying racks and containers for manufacturing, assembly and stamping operations, our equipment interfaces range from manual operator control with forklift loading/unloading to fully automated solutions with robotic and AGV delivery functions. Material handling solutions include heavy duty rack handling in various conveyor configurations: Over Under, Side by Side, Linear, L-shape, and the new Roboloader™, using various technologies: Air Bearing (IndexAir™), Chain, Roller (IndexEr™) and Flow Racks (FlowAir™). SailRail is also a leader in ergonomic equipment: Carts/dollies (ErgoKart™), lift tables, tilt tables, turn tables (Acculine). An extensive line of products designed for fork free environments is available. Our scope of service can include the supply of equipment for an individual work cell application to the design, manufacture, test and integration of equipment for entire facilities. Not only has SailRail has been a Tier 1 automotive supplier for over 30 years, we have also provided material handling solutions for the food services industry, the Canadian Coast Guard, copier toner plants, and various facilities that manufacture everyday household products. Scroll down for our partial product history. SailRail is an ISO 9001:2015 certified company, demonstrating our continuous commitment to the highest possible standard of quality control for our customers. Scroll down for our QMS Scope and Policy.